But Silicon Valley cannot be replicated from the top down with money and facilities. Because Silicon Valley is not a place. It’s a mindset. Entrepreneurs in Silicon Valley fail more than entrepreneurs anywhere else in the world, but it is their “ability to fail” that helps them ultimately take risks and succeed. When a culture can accept and mitigate the risks of failure — both financially and socially, and through both public policy and social constructs — then entrepreneurship can prosper and true creativity can be unleashed. Every community has super-smart people, but in most places, they are dispersed across separate industry circles and rarely interact. Silicon Valley “geek culture” is inclusive, open minded, diverse, and quirky. Why? Because smart people generally share one common trait — they are creative. Implement and encourage creative projects in your community to attract, gather, and support your geek culture. Yes, Silicon Valley has the brand name VCs, but more importantly it has vast, informal networks of angel investors that pool their money to seed promising projects. AngelList’s “Syndicates” is a step toward formalizing these networks, but the more you can tap into, educate, and gather existing networks of wealth around startups, the better your ecosystem will be. In the end, if great companies are built somewhere, the capital will follow. Above all else, Silicon Valley is an amazingly tight-knit and collaborative culture. People of all skill sets, backgrounds, and experiences get together almost nightly here to share ideas, best practices, and metrics, and to provide each other feedback. Why? Because we understand that helping each other and sharing expertise leads to faster iteration, more efficient innovation, faster market growth, and ultimately a larger pie for all. Entrepreneurs have so much to gain by working together, because ideas don’t matter — execution does. Forget the NDAs, and stop creating “competitions.” Instead, start creating ways for people to collaborate and share knowledge with the next generation of founders. It will make your community infinitely more successful. Want to Bring this Mindset to Your Community? 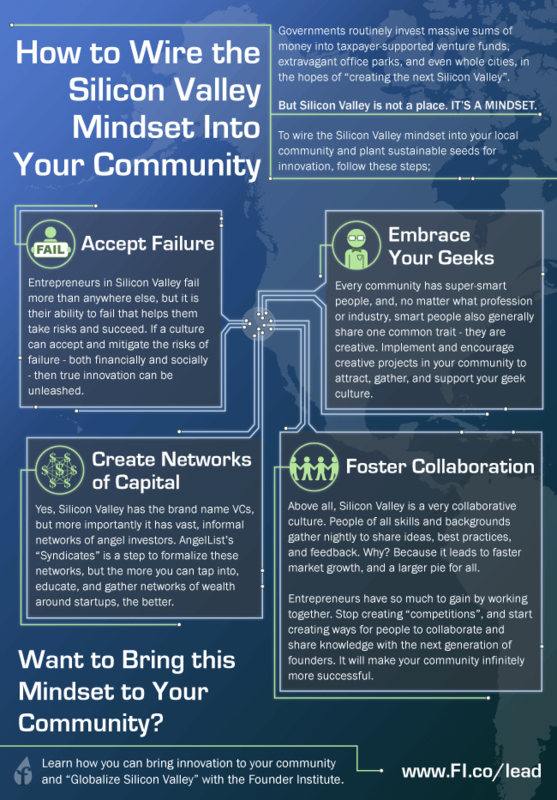 Check out the infographic below, and learn how the Founder Institute’s method of “Globalizing Silicon Valley” can help you wire your community for innovation here.